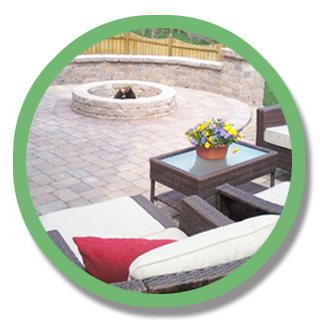 A: We specialize in Outdoor living spaces and hardscapes including paver patios, paver driveways, paver walkways, retaining walls, seating walls, pillars, outdoor lighting, outdoor kitchens, outdoor fireplaces and fire-pits, decks and pergolas. You can visit our Gallery page for a sample of some of our projects. Q: How do I get started and how does the process work? A: The best ways to get started is to either give us a call @ (513) 646-4330 or by filling out your information via our request a quote form so we can set up a consultation. During our appointment, we will learn about your desires and expectations for the project and then go back to create your design. Once we have completed your custom design, we will present it to you along with the costs associated with the project. Q: How much of an investment will it take for an Outdoor Living Space? A: Our projects range from the $5k-$50k depending on the details, challenges of the project and the owner’s desires. Q: How can I pay for my outdoor room? A: We accept checks, cash or credit cards. This is typically broken into two payments, at the start and completion of the project. A: Each and every project will vary depending on the variables of the job. Most projects are completed in 1-2 weeks, but larger projects can take much longer. Q: Do you offer a warranty of any kind? A: Yes we do offer a 2 year warranty on all our services and products. We stand by our work and have a more detailed explanation in our contracts on everything that is covered in the warranty. Outdoor Envy, LLC, established in 2008 in Cincinnati, Ohio, specializes in the design and installation of residential hardscapes and outdoor living spaces including brick pavers, retaining walls, seating walls, decks and fences. Outdoor Envy, LLC is quickly becoming one of the leaders in the industry with our ability to focus on the clients ideas and wishes and creating a truly unique outdoor living space. Call Us Today at 513.646.4330!